The first paper below is a rough sketch of what I thought I might want in my vineyard. I referenced many of my books that I had to come up with this plan. The estimated yields listed on this paper came from an equation I found in one of my books that helps estimate yields based on vine numbers and a few other factors. You may also notice that some numbers are crossed out and that is because the plan was later modified. This plan did not come out as clear because I used a lighter lead pencil and also there is a lot of stains on the paper because I was using it out in the field when the grape vines where being planted. From this plan though you can see how I have my 6 rows laid out and how they are oriented. Along with how the vines and trellis supports will be positioned. I am still trying to decide how I want to position my wires in regard to distance from the vineyard floor. 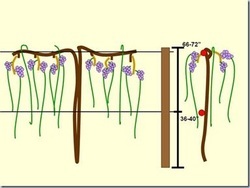 I also am still deciding what trellis system I want to use for the different vines I am thinking that I will be using is mid wire cordon for the Marquette A.K.A. VSP (Vertical Shoot Positioning). For the Vitis Lambrusco grapes such as Concord and Niagara I will be using a 4 arm Kniffin. 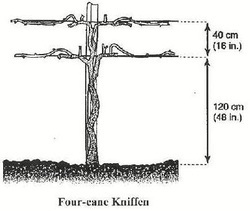 As for the Marechal Foch and NY Muscat I am split between a Top wire cordon and a 4 arm Kniffin. I will post my final sketches for the wire placement later this winter.